We will focus on fun things to do in Durham any time of the year. First of all, visitors to Durham can see sports throughout the year. In fact, in 2017, the Durham Bulls WON the Triple-A National Championship Title for the second time in the history of the franchise. Durham is also home to two universities (Duke University and North Carolina Central University) which both compete in various sports happening throughout the year. Guests can also tour these college campuses during any season. Durham is known as a city for “Foodies” (people who have a particular interest in food). 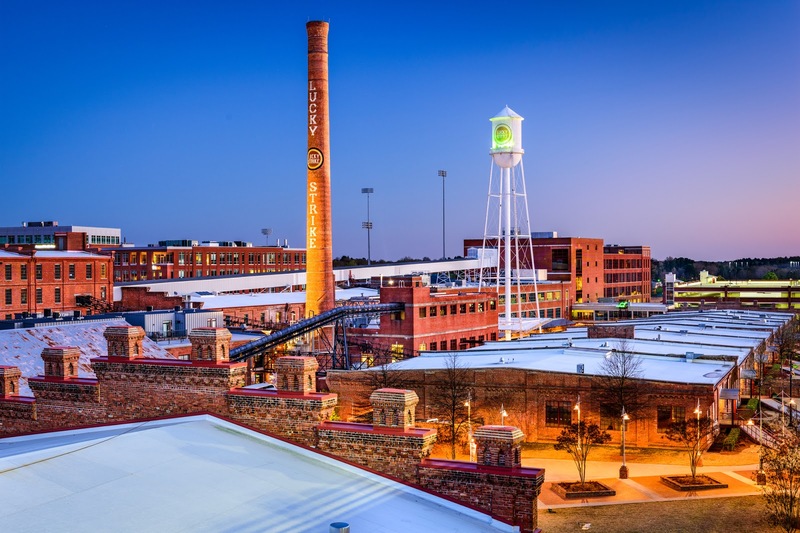 In 2013, Southern Living Magazine named Durham the “Tastiest Town in the South.” There are many award-winning restaurants as well as a great variety of cuisines to choose from. The Bull City also is home to numerous Food Trucks like American Meltdown and Chirba Chirba Dumpling. Durham is famous for its music. Local and national jazz artists can be heard at the Beyu Caffe and The Shed. Rock out at the Pinhook and Motorco Music Hall. Professional musicians that live here in Durham include Branford Marsalis and Nnenna Freelon. Durham entertainment includes Broadway musicals and celebrity concerts at the Durham Performing Arts Center. The Carolina Theatre hosts concerts, stand-up comedy, and movies (including their annual Documentary Film Festival). There are so many fabulous places to shop in Durham! This includes American Tobacco Campus, Downtown Durham, The Brightleaf Square District, Ninth Street, the Northgate Mall, and the Streets at Southpoint. Shop cool boutiques like Magpie, Exotique Boutique, Smitten, Vert & Vogue. Bookstores include The Regulator, Letters, Books Do Furnish a Room, and Wentworth & Leggett. Durham art is like no other. Art can be seen at local university museums such as Nasher Museum of Art at Duke University and the NCCU Art Museum. Thanks to the Durham Arts Council promoting the arts and local artists as well as the Durham History Museum which has documented major events in our city’s history. Durham is also home to The Scrap Exchange, a creative re-use arts center that hosts classes, offers a Make N Take classroom for open studio art-making, and has a retail store with many different materials and objects that can be creatively used again for another purpose. Crafted pottery, jewelry, and artwork is at the Durham Craft Market and the Durham Patchwork Market. If you love watching sports, touring college campuses, tasting food, listening to music, watching live theater and concert performances, shopping till you drop, and appreciating arts and crafts, you will love the Bull City. Morehead Manor Bed and Breakfast invites you to enjoy our warm Southern hospitality as well as our comfortable yet elegant accommodations. Savor our complimentary gourmet breakfasts each morning you stay with us. We (Monica and Daniel) are happy to give you recommendations of places to go and things to do in Durham based upon your interests. This entry was posted in Durham and tagged American Tobacco Campus, Duke University, Durham, Durham Bulls, Durham Performing Arts Center, entertainment, Foodies, music, Nasher Museum of Art, North Carolina Central, sports, The Scrap Exchange by admin. Bookmark the permalink.